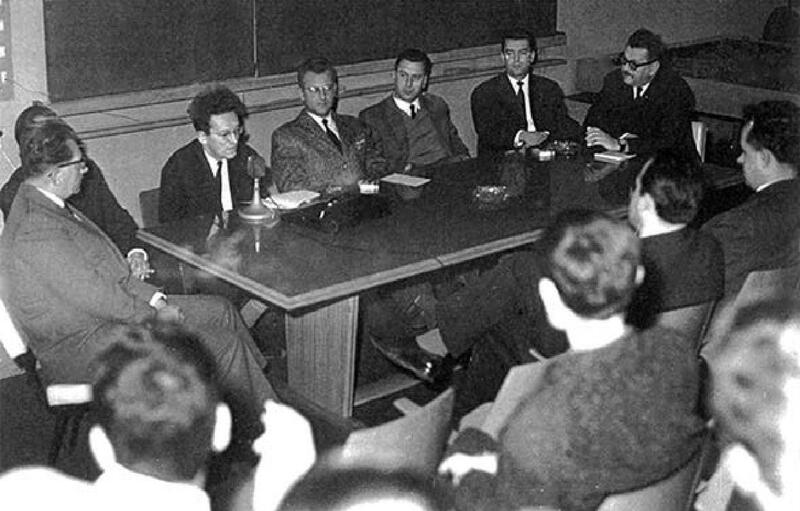 The first public appearance of the entire editorial board of Praxis (Student Centre, Zagreb, end of 1964). From left to right: Rudi Supek, behind him (obscured from view), Branko Bošnjak, Gajo Petrović (editor-in-chief), Danilo Pejović (editor-in-chief), Predrag Vranicki, Milan Kangrga, Danko Grlić; far right (with back turned): the director of the Student Centre, M. Heremić, next to him, Antun Žvan. In the first issue of Praxis in 1964, the first core Praxis group, consisting of Zagreb-based humanist thinkers (philosophers and sociologists), proclaimed the basic platform of the future Praxis critical orientation. In his introduction entitled “Čemu Praxis?” (“Why Praxis?”) Praxis editor-in-chief Gajo Petrović announced the primary origin of the future Praxis orientation: “criticism of all that exists” (the phrase was taken from Karl Marx). This motto served as a principal starting point which generated a decade of criticism by Praxis thinkers; first of all philosophical and sociological analysis dealing with various topics and forms of “everything existing” in the sense of links between freedom and practice (the syntagma “all that exists” combined with criticism provides both an active and social meaning: the truth is verified in practice) This standpoint became the focal point for differentiation and promotion of the culture of dissent among Praxis thinkers and those supporting this orientation, but also among those who disputed it. Considering the promotion of the culture of dissent, which was in opposition to the concept of a single-party system, the editors of Praxis and the leaders of the Korčula Summer School were exposed to government attacks. The photograph, which was owned by Asja Petrović, is located in the Praxis and Korčula Summer School Collection. The photo is also published in the book written by Ante Lešaja (2014). Lešaja, Ante. 2014. Praksis orijentacija, časopis Praxis i Korčulanska ljetna škola [građa] (Praksis Orientation, Journal Praxis and The Korčula Summer School [collection]). Beograd: Rosa Luxemburg Stiftung, p. 218.